I love to cook on a steamer. I use it almost everyday because cooking is so boring for me and the steamer is quick, healthy and tasty. 😛 Salmon is my favourite, it’s just delicious! I cook there my vegetables also and I serve them with just olive oil and vinegar or I prepare some sauce like something with balsamic and honey. You can cook rice and add some spices afterwards, you can prepare dumplings on weekends, freeze them and cook them on week days. I don’t have a specific recipe to share with you, as I improvise and often I mix and match and I cook some on the steamer and other on a pot or I prepare a salad. For example you could steam chicken, stir fry some vegetables or cook some rice with chicken/vegetable broth and make a mustard-honey sauce for the chicken. 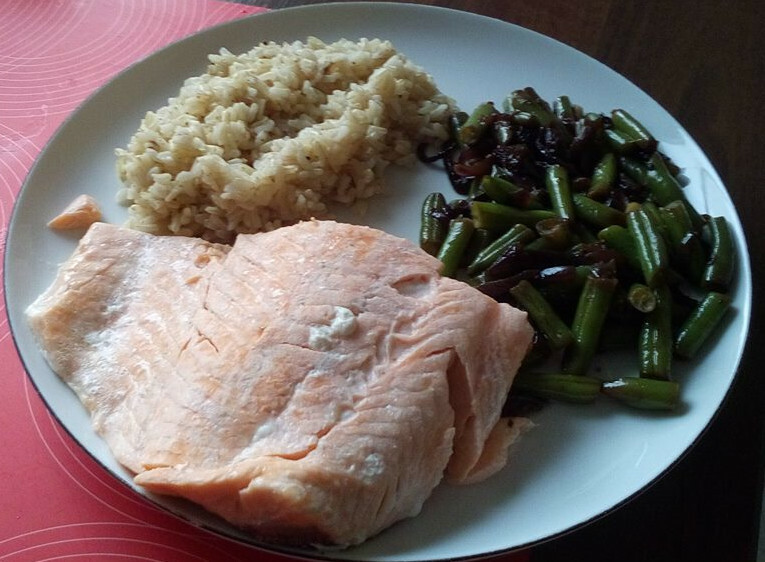 Yesterday I steam salmon and brown rice and stir fried some green beans with onions, garlic and soy sauce (check the image). I served the salmon with Tabasco and the rice with a mix of 4 types of pepper. PS: For the mustard-honey sauce I don’t use mayo. You can just use these ingredients and it’s delicious: 2 tablespoons Dijon mustard (if you don’t like Dijon you can use the usual mustard), 2 tablespoons honey, 2 teaspoons white wine vinegar, 1 tablespoon oil (vegetable or olive oil), salt and pepper if you want. I love the following chili, I did find it following one of Jessica’s links a few months back, but the recipe has been tried and approved by family. It’s also very good once reheated so don’t hesitate to make large quantities to last for more than one meal. Great website!! I love eating 0% greek yogurt or organic apple sauce with organic raisins as my snacks. Not a recipe, but a website I use very often for healthy recipes ~ http://www.skinnytaste.com/. She even posts weekly meal plans, if you are interested . . . takes away some of the planning task. Thanks for the link Kathleen! Blend until smooth and add 1 tablespoon unsweetened coconut flakes on top. Enjoy!